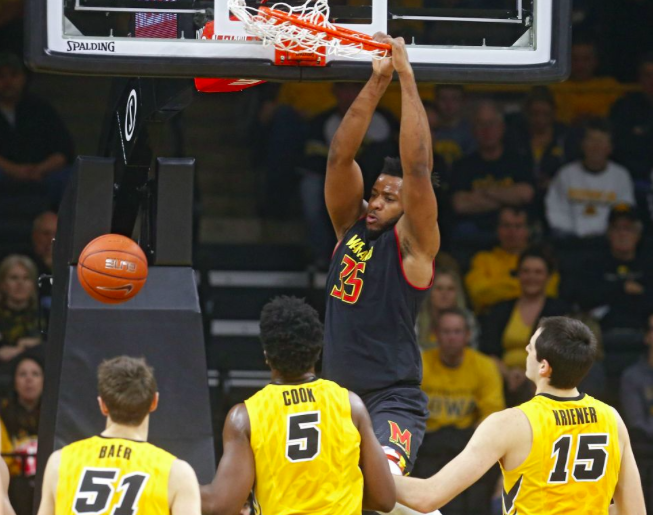 IOWA CITY, Iowa – After a sluggish start against Maryland, the Iowa men’s basketball team finally found some energy that had been lacking since they suffered a lopsided loss at Northwestern on Sunday. Thanks in-part to a 10-0 run in the middle of the second half, the Hawkeyes were able to erase a nine-point halftime deficit and take a three-point lead with just over five minutes to play. 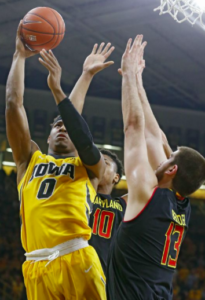 The comeback attempt came up a little short, however, as the #25 Maryland Terrapins held on for an 84-76 victory on the road at Carver-Hawkeye Arena. The game looked like it could turn into a blowout in the first half, but the Hawkeyes came out of halftime with a sense of urgency that simply was not there at the start of the game. The 10-0 run seemed to shift the momentum in favor of the Hawkeyes, but Maryland fought back and was able to outlast the Iowa push. A pair of Melo Trimble three-pointers turned a three-point Iowa lead into a three-point Maryland lead, and the Hawkeyes were never able to get over the hill again. A lot of points were left on the floor for the Hawkeyes, as the team was just 27-of-70 from the field (35.7%) and 7-28 from three-point range (25.0%). However, the team did go 19-of-25 from the free-throw line (76.0%), highlighted by a 6-of-8 showing from forward Tyler Cook, who had been struggling to find his stroke from the line. 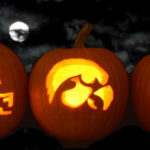 The Hawkeyes also won the turnover battle, forcing 21 Terrapin turnovers and turning them into 30 points. They also outrebounded the Terps by three and allowed only seven second-chance points on just six offensive rebounds. Still, a slow start for a second straight game ultimately led to a second straight Big Ten loss for the Hawkeyes. For the third time in the last four games, the team has turned to some unlikely players to lead them through their toughest battles. In the middle of the second half when the Hawkeyes made their big push, the lineup consisted of point guard Jordan Bohannon and four reserves in Baer, Ahmad Wagner, Brady Ellingson, and Ryan Kriener. Iowa forwad Ahmad Wagner puts up a shot against Maryland’s Ivan Bender in the second half of the Iowa’s 84-76 loss on Thursday (via Stephen Mally/Cedar Rapids Gazette). Forward Ahmad Wagner highlighted the group’s success with four offensive rebounds in the second half and 12 points on 3-of-5 shooting from the field and 6-of-8 shooting at the free throw line. The sophomore brings a lot of hustle and energy to the floor, and he was able to really settle down and get into a rhythm for the first time this season. While it gives him confidence in himself moving forward, he knows the team getting a win is more important than his success. Even though the score did not finish in the Hawkeyes’ favor, depth proved to be a strong point on this Iowa team. On any given night, it appears to be anyone’s guess as to who will step up and play impactful minutes down the stretch. Now, the Hawkeyes move into a “bye week” as they will have six days between now and their next game when they travel to play at Illinois. The team is looking forward to the break so that they can work to improve their own game for a couple of days without focusing on an opponent. It will also give Peter Jok a chance to rest after nursing a back issue for the last couple of games. “We’ll utilize this time to work on ourselves internally and work on the things we need to fix up,” Baer said. 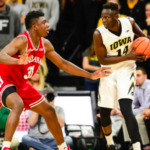 The Hawkeyes (11-9, 3-4 Big Ten) travel to Champaign, Illinois to take on the Fighting Illini (12-7, 2-4 Big Ten) on Wednesday January 25th at 8 p.m. CST on Big Ten Network.